Pancharatra (IAST: Pāñcarātra) was a religious movement in Hinduism that originated in late 1st millennium BCE around the ideas of Narayana considered as an avatar of Vishnu. The movement later merged with the ancient Bhagavata tradition and contributed to the development of Vaishnavism. The Pancharatra movement created numerous literary treatises in Sanskrit called the Pancharatra Samhitas, and these have been influential Agamic texts within the theistic Vaishnava movements. Literally meaning five nights (pañca: five, rātra: nights), the term Pancharatra has been variously interpreted. The term has been attributed to a sage Narayana who performed a sacrifice for five nights and became a transcendent being and one with all beings. The Pancharatra Agamas constitute some of the most important texts of many Vaishnava philosophies including the Dvaita Vedanta of Madhvacharya and the Srivaishnava Sampradaya of Ramanuja. The Pancharatra Agamas are composed of more than 200 texts; with various suggested time periods of composition; including the 3rd century BC, and a period between 600 AD to 850 AD. The Shandilya Sutras (~100 CE) is the earliest known text that systematized the devotional Bhakti pancharatra doctrine and 2nd-century CE inscriptions in South India suggest Pancharatra doctrines were known there by then. The 8th-century Adi Shankara criticized elements of the Pancharatra doctrine along with other theistic approaches stating Pancaratra doctrine was against monastic spiritual pursuits and non-Vedic. The 11th-century Ramanuja, the influential Vaishnavism scholar, developed a qualified monism doctrine which bridged ideas of Pancharatra movement and those of monistic ideas in the Vedas. The Pancharatra theology is a source of the primary and secondary avatar-related doctrines in traditions of Hinduism. Pancharatra has likely roots in 3rd-century BCE, as a religious movement around the ideas of a sage Narayana who is an avatar of Vishnu. The earliest use of the word Pancharatra is found in section 7.1.10 of the Taittiriya Samhita, a Vedic text. The section describes a person going through a Pancharatra ritual to become a master of rhetorics. The section 13.6 of the Śatapatha Brāhmaṇa mentions Nārāyaṇa as the primordial divinity who performs this offering. The Narayaniya section of the Mahabharata (XII, 335-351) refers to seven rishis who say the Pancharatra system was made consistent with the Vedas. Though the five day ritual is mentioned along with many other sacrifices in the Vedic text, the origins of Pancaratra devotees of Vishnu and their tradition is unclear except that it has been very old. The movement merged with the ancient Bhagavata tradition also around Krishna-Vasudeva, and contributed to the development of Vaishnavism. According to J. A. B. van Buitenen, the word "Pancharatra" is explained in Naradiya Samhita as referring to a tradition of "five knowledges". Similarly, Jan Gonda states that the term "nights" in "five nights" in the Pancharatra tradition may be a metaphor for inner darkness, and "came to mean – how, we do not know", though indeed there have been many interpretations such as "five systems", "five studies" and "five rituals". The 1st-century works by Shandilya are the earliest known systematization of the Pancharatra doctrine. This doctrine was known and influential around then, as is attested by the 2nd-century CE inscriptions in South India. Evidence suggests that they co-existed with the Bhagavata tradition in ancient times. The Advaita Vedanta scholars, such as Adi Shankara, criticized elements of the Pancharatra doctrine along with other theistic approaches stating it was against monastic spiritual pursuits and non-Vedic. According to Suthren Hirst, Shankara supported the use of icons and temple worship if it focussed as a means to comprehend Brahman as the sole metaphysical reality. However, he opposed devotional theism as an end in itself and the goal of spiritual pursuits. The Pancharatra tradition has historically disagreed with claims of it being non-Vedic, states Gonda, and Pancharatra texts explicitly state that, "Pancharatra is Vedic, it originates in the Sruti" and that the "Pancharatra precepts and practices should be observed by anyone who has allegiance to the Vedas". The 11th-century Ramanuja, the influential Sri Vaishnavism scholar, was born in Pancharatra tradition, disagreed with Shankara, and developed a qualified monism doctrine which integrated ideas of Pancharatra movement and those of monistic ideas in the Vedas. Ramanuja stated that the Vishnu of Pancharatra is identical to Vedanta's Brahman, where Purusha reflects the eternal soul that is Vishnu, and Prakriti the impermanent ever changing body of Vishnu. Vishnu worshipers of today, represented in a wide spectrum of traditions, generally follow the system of Pancharatra worship. The concept of Naḍa and Naḍa-Brahman appear already in Sāttvata Samhita or Sāttvata Tantra and in Jayākhya Samhita, two texts considered most canonical of Pancharatra texts. Ānanda Tīrtha the founder of Madhva line has written in his commentary on Mundaka Upanishad:  "In Dvāpara-yuga, Vishnu is exclusively worshiped according to the principles of the Pancharatra Scripture, but in this age of Kali-yuga, the Supreme Lord Hari is worshiped only by the chanting of his Holy Name." Jiva Gosvami had stated in his Paramātma Sandārbha, forming part of six principal Sandārbhas, or philosophical treatises of Gaudiya Vaishnavism, that, "Seeing that the imperfect scriptures in the modes of passion and ignorance bring only a host of troubles, and also seeing that the original Vedas are very difficult to follow properly, and thus being very dissatisfied with both of these, the all-knowing scripture authors affirm the superiority of the Pancharatras, which describe the pure absolute truth, Narayana, and the worship of the Lord, which is very easy to perform." but is also an individual. to realize the bliss of union with the Supreme. The Pancharatra theology developed over time. It presents a dualistic theory on how creation manifested from a godhead, as the Purusha-Prakriti and as the masculine-feminine manifestations of the divine. It states that the creation emerged through vyuhas (arrangements). In the beginning, states Pancharatra doctrine, there was only Vasudeva-Krishna (Vishnu-Narayana, Vasudeva literally means "indwelling deity") as the highest changeless god. It arranged into Saṅkarṣaṇa (Balarama) as the lord over all life, then Pradyumna creating mind, and Aniruddha as ego (ahamkara). Thereafter, Brahma emerged from Aniruddha who created the empirical universe. Thus, the divinity was and is everywhere in Pancaratra, but in different aspects, one form or phase emerging from the previous. During the 11th century AD Ramanuja, a founder of Sri Vaishnava traditions of Vaisnavism had established the Pancharatra system of Vaisnavism for his followers. His philosophy of worship of Narayana was based on the pancaratric teachings. Archa: visible icon form, filled with symbolism, consecrated in temples or revered images inside home (Shalagrama, conch shell, festive decorations), a means to remember and meditate on the supreme. The Vyuha-related Pancharatra theology is a source of the primary and secondary avatar-related doctrines in traditions of Hinduism, particularly Sri Vaishnavism. According to Barbara Holdrege, a professor and comparative historian of religions, the Pancharatra doctrines influenced both Sri Vaishnavism and Gaudiya Vaishnavism, albeit a bit different. 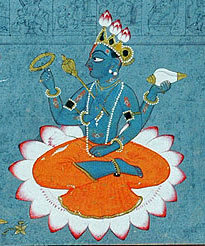 In Sri Vaishnavism, Vishnu-Narayana is supreme, while Vasudeva, Samkarsana, Pradyumna and Aniruddha are the four Vyuhas. In Gaudiya Vaishnavism, the Vyuha theory is more complex, Krishna is "Svayam Bhagavan" (the ultimate, Brahman) who manifests as Vyuhas, and he along with Samkarsana, Pradyumna and Aniruddha are the Vyuhas and the Purusha-avataras of the material realm. 11th-century Vaikuntha Chaturmurti. It is one of the iconic representation of the Pancharatra Vyuhas theory found in some medieval Hindu temples. The Pancharatra tradition has taught Panchakala or five observances every day. The first is called Abhigamna or ablutions and morning prayers to god. This is followed by Upadana or collecting worship materials. The third practice is Ijya or worship with offerings. The fourth practice in the Pancharatra tradition has been daily study or Svadhyaya. The fifth recommended practice is Yoga and meditation. The significance of divine manifestation theology in Pancaratra tradition is it believes that an understanding of the process by which Vishnu-Narayana emerged into empirical reality and human beings, can lead one to reverse the process. Through practicing the reversal and moving from the empirical to ever more abstract, according to Pancaratra, human beings can access immanent Vasudeva-Krishna and thereby achieve salvific liberation (moksha). The Vaishnava temples and arts since the Gupta Empire, states Doris Srinivasan, attempted to present the Pancaratra ideas. In this system, states Srinivasan, "Vasudeva, literally, "the indwelling deity," is the first emanation and the fountainhead of the successive emanations, which may be represented either anthropomorphically or theriomorphically in Hindu art". As one circumambulates the ancient and medieval Vaishnava cave temples, the devotee walks past from the icon representing Vasudeva (most abstract) and then the successive Vyuhas (literally, "orderly arrangement"). Isvara Samhita: meditation, worship and rituals. Of these Samhitas in Srirangam Sri Ranganatha Swamy temple "Sri Paramesvara Samhita", a variant of paushkara samhita is followed and in practice. In Sri Kanchipuram Varadaraja Swamy temple "Sri Jayakhya Samhita" is followed and in practice. In Sri Melukote Cheluva Narayana Swamy temple "Sri Ishwara samhita" is followed and in practice. In Tiruvellarai Sri Pundarikaksha Swamy Temple "Sri Paadma Samhita" is followed and in practice. In Tirukkudantai (kumbakONam) Aravamudhan Sarngapani is worshipped with "Sriprasna samhita". Rest of the places use Padma samhita or its variants. Gaudiya Vaishnavas follow Brahma Samhita and "Naradiya Samhita". ^ a b c d e f g h i j Constance Jones; James D. Ryan (2006). Encyclopedia of Hinduism. Infobase Publishing. pp. 321–322. ISBN 978-0-8160-7564-5. ^ a b c Jan Gonda (1977). Medieval Religious Literature in Sanskrit. Harrassowitz. pp. 39–41. ISBN 978-3-447-01743-5. ^ Oriental Institute, Maharaja Sayajirao University of Baroda (1940). Gaekwad Oriental Series, Issue 86, p.7. ^ a b van Buitenen, J. A. B. (1962). "The Name "Pañcarātra"". History of Religions. University of Chicago Press. 1 (2): 291–299. doi:10.1086/462449. ^ Constance Jones; James D. Ryan (2006). Encyclopedia of Hinduism. Infobase Publishing. p. xxviii. ISBN 978-0-8160-7564-5. ^ a b c Suthren Hirst (2008). Nile Green; Mary Searle-Chatterjee (eds.). Religion, Language, and Power. Routledge. pp. 107–108. ISBN 978-1-135-89287-6. ^ a b c Ariel Glucklich (2008). The Strides of Vishnu: Hindu Culture in Historical Perspective. Oxford University Press. pp. 178–180, 66–70. ISBN 978-0-19-971825-2. ^ a b c d e f g James G. Lochtefeld (2002). The Illustrated Encyclopedia of Hinduism: N-Z. The Rosen Publishing Group. p. 493. ISBN 978-0-8239-3180-4. ^ a b c d e f g h i j k l Roshen Dalal (2010). Hinduism: An Alphabetical Guide. Penguin Books. p. 293. ISBN 978-0-14-341421-6. ^ 1905-1982., Hazra, R. C. (Rajendra Chandra), (1987). Studies in the Purāṇic records on Hindu rites and customs (2nd ed.). Delhi: Motilal Banarsidass. ISBN 9788120804227. OCLC 29942414. ^ Jan Gonda (1977). Medieval Religious Literature in Sanskrit. Harrassowitz. pp. 46–50 with footnotes. ISBN 978-3-447-01743-5. ^ S. Krishnaswami Aiyangar (1995). Some Contributions of South India to Indian Culture. Asian Educational Services. pp. 284–285. ISBN 978-81-206-0999-0. ^ Jan Gonda (1977). Medieval Religious Literature in Sanskrit. Harrassowitz. pp. 49–50 with footnotes. ISBN 978-3-447-01743-5. ^ S. Krishnaswami Aiyangar (1995). Some Contributions of South India to Indian Culture. Asian Educational Services. p. 285. ISBN 978-81-206-0999-0. , Quote: "The establishment of the teaching of the Pancharatra as Vedic in character and as one form of Vaishnavism was one of the achievements of Ramanuja". ^ a b Nanditha Krishna (2009). The Book of Vishnu. Penguin. p. 135. ISBN 978-0-14-306762-7. ^ Knut A. Jacobsen (2008). Theory and Practice of Yoga : 'Essays in Honour of Gerald James Larson. Motilal Banarsidass. pp. 130–134. ISBN 978-81-208-3232-9. , Quote: "The dualism of Samkhya-Yoga is fundamental to the Pancaratra tradition." ^ Roshen Dalal (2010). Hinduism: An Alphabetical Guide. Penguin. pp. 458–459. ISBN 978-0-14-341421-6. ^ a b Barbara A. Holdrege (2015). Bhakti and Embodiment: Fashioning Divine Bodies and Devotional Bodies in Krsna Bhakti. Routledge. pp. 73–75. ISBN 978-1-317-66910-4. ^ Gail, Adalbert J. (1983). "On the Symbolism of Three- and Four-Faced Visnu Images: A Reconsideration of Evidence". Artibus Asiae. 44 (4): 297–307. doi:10.2307/3249614. ^ Jitendra Nath Banerjea (1968). Religion in Art and Archæology: Vaishṇavism and Saivism. University of Lucknow. pp. 32–34. ^ Upinder Singh (2008). A History of Ancient and Early Medieval India: From the Stone Age to the 12th Century. Pearson. pp. 512–513. ISBN 978-81-317-1677-9. ^ a b D Dennis Hudson (2008). The Body of God: An Emperor's Palace for Krishna in Eighth-Century Kanchipuram. Oxford University Press. pp. 491–492. ISBN 978-0-19-970902-1. ^ Roshen Dalal (2010). Hinduism: An Alphabetical Guide. Penguin. pp. 13, 459. ISBN 978-0-14-341421-6. ^ Roshen Dalal (2010). Hinduism: An Alphabetical Guide. Penguin. p. 13. ISBN 978-0-14-341421-6. ^ D Dennis Hudson (2008). The Body of God: An Emperor's Palace for Krishna in Eighth-Century Kanchipuram. Oxford University Press. pp. 450–451. ISBN 978-0-19-970902-1. Aiyangar, Pandit M. Duraiswami, and Venugopalacharya, Pandit T. Sri Pancaratraraksa of Sri Vedanta Desika. The Adyar Library and Research Centre, Madras, India, 1996. Apte, Dr. P. P. (edited). Pauskara Samhita. Rashtriya Sanskrit Vidyapeetha, Tirupati Series No.54, Tirupati, India, 1991. Gupta, Sanjukta. Laksmi Tantra, A Pancaratra Text. E.J.Brill, Leiden Netherlands 1972, reprint Motilal Banarsidass Publishers, Delhi, 2003. Krishnamacharya, Pandit V. (edited). Ahirbudhnya-Samhita of the Päncaräträgama (vol I and II). The Adyar Library and Research Centre, Madras, India, 1986. Matsubara, Mitsunori, Monotheistic Theory of the early Vaisnavas, Vyuha Theory in the Early Pancaratra, 1990. Matsubara, Mitsunori, The Formation of the Pancaratra's Theory of the Four Vyuhas, 1991. Otto Schrader, F., Introduction to the Pancaratra and the Ahirbudhnya Samhita, Adyar Library, Madras 1916. Second edition 1973. Rangachar, S., Philosophy of Pancaratras, Sri Devi Prakashana, Mandya (Karnatak) 1991. Rao, S.K. Ramachandra. The Ägama Encyclopedia: Päncharäträgama. Volume IV, Sri Satguru Publications, Delhi, India, 2005. Sarma, Pandit K. Ramachandra (edited). Pauñkarägama. The Adyar Library and Research Centre. Madras, India, 1995. Siddhantashastree, Rabindra Kumar. Vaisñavism Through the Ages. Munshiram Manoharlal Publishers Pvt. Ltd., New Delhi, 1985. Sutton, Nicholas, Religious Doctrines in the Mahabharata, Motilal Banarsidass, New Delhi 2000.